This newcomer really packs a punch with its multicolored flowers, reliable garden performance and stylish versatility. Eye of the Tiger boasts unusual rich purple blooms accented by burnished yellow throats-a highly sophisticated color palette. 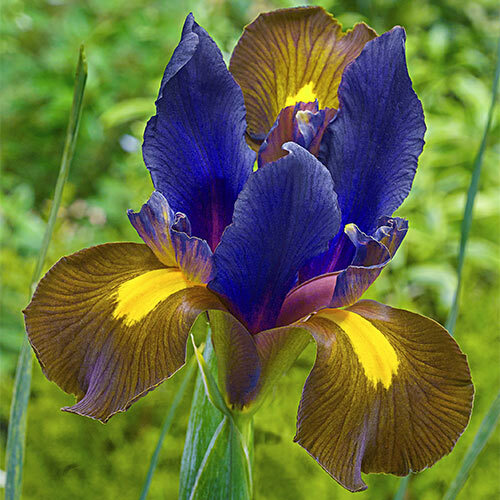 This variety looks amazing when planted alongside solid yellow iris-the throat color really pops! Or highlight the dominate purple color instead by pairing Eye of the Tiger with similar deep lavender perennials. Dependable blooms appear in late spring and prefer sunny, well-drained and humus-rich sites. Place where the flowers can be easily viewed-such as borders, cutting gardens and rockeries-for the greatest landscape impact.